Welcome to Scout Me & Fix My Game! This is a scouting service available for players who would like to invite Coach Ricky Taylor, to their game to receive an in-depth professional player evaluation. A player evaluation will list a player’s strengths, weaknesses, areas of improvement, projected college level and potential, and pro potential. NCAA Division I coaches are permitted to subscribe to this service for football, men’s, women’s basketball. Training over 100 players, Coach Ricky is a professional skills coach in which he trains professionals all the way down to the children. One of strengths is to identify a players’ weaknesses to help turn them into strengths. Coach Ricky travels all around the country to scout, critique, and analyze players. Book your game today! *Please note that player evaluations are based upon the skill level of the player. 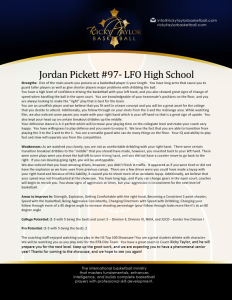 Some players only receive 1 page evaluations and some receive up to 6 pages depending on the player’s position, activity on the court, and minutes played.